Our Daily Deal today is a salute to all the Burns Suppers happening tonight on the eve of Robbie Burns Day tomorrow. After all, what better occasion to sample a wee dram! 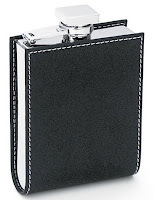 This chic little flask makes a great gift for groomsmen (stock up now for that summer wedding! ), a milestone birthday or any other occasion that calls for a keepsake gift for him. We've reduced the price by 50%, and only while stocks last. Simply click below for more information and to purchase. This stylish stainless steel flask is wrapped in black leather and contrast stitching for a contemporary twist on the classic gift for him for any occasion. The screwcap lid is attached with a hinged arm to ensure the flask never goes lidless, even if the owner does. Holds 5oz.